The Great Maze is the final level of Super Smash Bros. Brawl Subspace Emissary. After the whole World of Trophies is sent to Subspace, Tabuu combines all the levels of the game and mixes them all together to create one large maze which has parts from all the levels all the characters have been in. The heroes of the game are forced to go through this large maze. However, to beat this level, the player must not go to a goal. To beat it, the player must fight False Character versions of all the characters in the game (excluding Toon Link, Wolf O'Donnell, Sonic the Hedgehog and Jigglypuff). Aside from that, the player must also defeat all the bosses encountered in the game (excluding Master Hand and Crazy Hand). There is no specific order that the player must beat all the enemies – the player can also choose to play as any character he or she wants. Also, there are various Check Points throughout the maze which the player can save, get back lost characters, adjust stickers, and change characters. The checkpoints are indicated by the the Super Smash Bros. emblem mounted on a trophy stand. 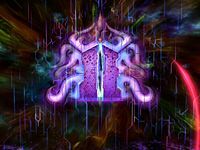 After the player has defeated all the "dark" characters and all the bosses again, the player will then open a large purple door which leads the player to Tabuu and the Final Battle begins. 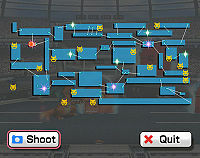 After the player beats Tabuu, the Great Maze is spread apart and all the levels and locations of the Smash World are returned to their normal state. A map of the Great Maze can be accessed any time by pressing the Start button. All characters that the player has saved in the previous level, Subspace, are playable. If the player has saved no characters, then only King Dedede, Kirby, Luigi, Ness, Bowser and Sonic the Hedgehog are used, however Sonic only appears before the boss fight with Tabuu. Sonic joins the party. Also, the secret doors in The Swamp, The Forest and The Ruins appear so the player can unlock Jigglypuff, Toon Link and Wolf O'Donnell. This page was last edited on April 11, 2018, at 07:10.